Nice, even patty shapes with this gadget! 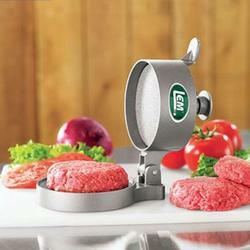 Easily adjust the thickness of your burgers from 1/4 inch to 1 inch when you press meat in this Non-stick Aluminum Burger Press. Shaping them in this meat press prevents the meat from being overworked by hand and therefore tough. Place freezer paper or special paper made for burgers on the press to make the meat easier to remove, and especially if you are planning to freeze the burgers for later use. The paper helps you separate those frozen burgers at a later date. Presses a large burger 4 3/8 inches in diameter. Easy to clean Especially if freezer paper is used in the press.